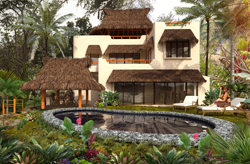 Dreamer Circle Properties in Sayulita - an Exclusive Estate consisting of 4 luxury oceanfront homes adjacent to each other, all with heated swimming and wading pools in Sayulita's Premier Location - Casa Paloma 6 bedrooms & 6 bathrooms, Casa Sonadora 3-4 Bedrooms & 3 1/2 bathrooms, Villa Colina 3-4 Bedrooms & 4 bathrooms, and Casa Carino 2-3 bedrooms & 3 Bathrroms. Add them altogether and you get to up to 6 kitchens and accommodations for 32+ people, this exclusive landmark is a dream come true in Sayulita's most sought after neighborhood. Availability calendars can be found on each home's page, click the photos or house names below to view. For availability of the entire estate, please contact us and we will be happy to assist you. Please note that we have a 7-night minimum and generally book from Saturday to Saturday during high season. Dreamer Circle Properties, with over a hundred 5 star reviews from very satisfied customers, consists of 4 architecturally designed luxury homes, on the little hill above the surf break in the center of town. You are only 1 1/2 blocks from the main beach and town square. No cars are necessary when staying in these exquisite properties and every imaginable amenity is provided. Watch the surfers below the houses, swim in the heated salt-water treated pools, luxuriate in the palapa roof top terraces with 360 degree views and walk the large tropical gardens, or even relax in a hammock in a treehouse! Please view each house and determine what configuration of homes would work best for your group. Our professional staff is outstanding in its kindness and service. A cook, masseuse, yoga instructor, surf instructor - you name it - can all be provided at an additional cost. PLEASE CLICK ON THE HOUSE NAMES OR PHOTOS BELOW TO VIEW EACH HOUSE, Here you will find full descriptions, with many photos, videos, testimonials, and availabilty and pricing. 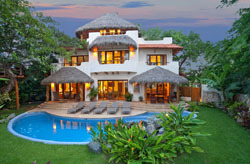 Casa Paloma 6 Bedrooms, 6 tiled bathrooms and 3 tiled kitchens, plus multiple gathering areas. The tranquility of Casa Paloma all comes together through an exceptional collection of colorful artisan objects that pleasantly recreates the Mexican spirit of life on the coast. 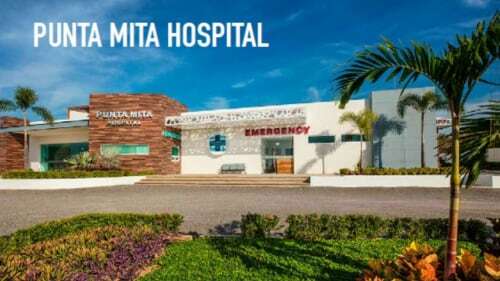 2 outdoor showers, an excellent pressurized water system with filtered drinking water, memory foam mattresses, A/C, WiFi, flat screen HD TVs, DVD and CD players with Ipod connections plus libraries, 100% cotton sheets, plus so much more. Casa Sonadora 4 Bedroom 4 bath Sayulita vacation rental home with every imaginable amenity and some amazing features found no where else in Sayulita. Added for January, 2016 we will have an additional bedroom, for a total of five bedrooms. This small room will be adjacent to the downstairs master bedroom with a bunk bed for two children. Every aspect of Casa Sonadora has been thoroughly considered and extraordinary views of the Pacific Coast in an oasis of tropical gardens viewed from every vantage point, and privacy assured. Villa Colina There are 3 bedrooms and a den with 4 full baths. There are two master suites with king beds - both with private terraces, incredible ocean views and one with its own private two person bathtub in a small garden. A third bedroom suite has 2 queen beds - one on the main floor and another in the wonderful loft. This suite has a kitchette, its own private patio with amazing ocean, town and mountain views, plus an outdoor lounge/bed. From this bedroom you will also have immediate access to the upper palapa terrace with ocean views. Casa Cariño 2 bedrooms, with an extra room that can be used as a 3rd bedroom, 3 bathrooms, two outdoor showers, a large bathtub and amenities galore. Relax and enjoy the heated salt water pool with waterfall and wading pool for the kids, lots of outdoor seating in the 3 outdoor living areas, huge palapa roof terrace with awesome ocean views. Designed with your privacy and comfort in mind, lush and beautiful tropical gardens surround this lovely home and offer privacy, serenity and gorgeous views of the hillsides, village and ocean. Casa Cariño is the newest addition to Dreamer Circle and is due to be complete in December, 2015, just in time for your Sayulita winter vacation! 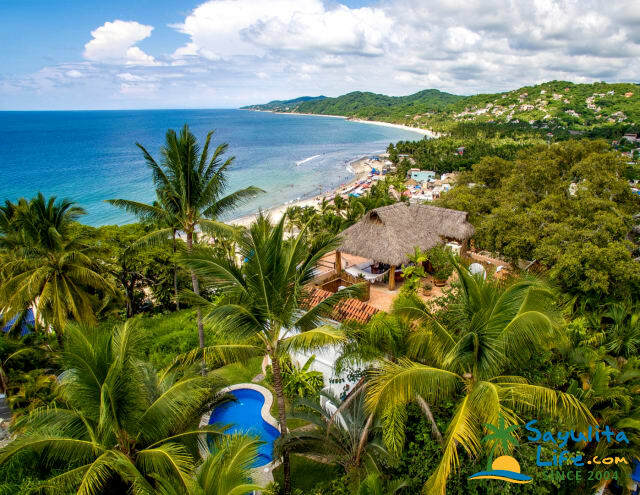 We rented Casa Paloma in Sayulita for a week to attend my daughter's Sayulita wedding and were very happy with the house, beautiful views and the location. The house is less than a 5 minute walk to Sayulita town centre. There were 12 people in our group and the other wedding guests loved staying in the adjacent houses in Dreamer Circle. The house manager, Ernesto, was extremely helpful and came by to check on us everyday. 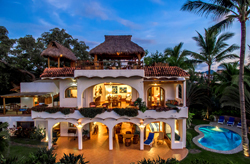 We would highly recommend this house to anyone visiting Sayulita! Villa Paloma was our home base for a week of wedding celebrations in Sayulita. It was a everything the website shows and perfect for our group of 12. The paintings and decor were perfectly suited to the villa, authentic and true. The views of surfers greeted us each morning as we had coffee and breakfast on the middle terrace with the largest kitchen. The housekeeper, Dora, was wonderful and kept the place spotless. The grounds were always beautifully groomed and the pool was kept clean. Santos and Ernesto were efficient and helpful. The villa is at the top of a nicely moderated hill that is a delight to walk up and take in all the tropical plants along the way. We thoroughly enjoyed our stay at Villa Paloma and miss the crashing waves of the ocean and the natural beauty and warm hospitality of Sayulita and its people. We spent a week with 5 couples at Casa Paloma at Dreamer Circle in Sayulita. The views from the home are absolutely spectacular. Any small issues we had (a/c in the casita did not work well) were far surpassed by the views and the staff. Dora, Santos and Marta are awesome! 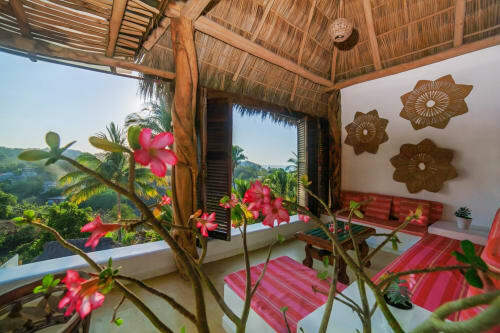 Casa Paloma in Sayulita was incredible, and simply everything you are looking for. The house is colorful, with Mexican artwork, beautiful views, and thoughtful architecture/interior design. The house manager, Ernesto, was very attentive and helpful in arranging extra services for us. The location with its proximity to the beach and town is ideal, while providing great views and privacy. We felt very secure. The only challenge we had was with the WiFi. Its also worth noting that the 6th bedroom has two single beds. We would definitely stay here again. We enjoyed a 3 day stay at Casa Paloma in Sayulita and were so happy with our choice! There were 12 people in our large group, 10 were couples and the house accommodated all of us very comfortably. We loved how every floor had a beautiful view of the beach and town and each bedroom had its own character, with artwork adorning the walls and unique tile work in the baths. Other features we enjoyed included the rooftop hammock, relaxing pool, and A/C in each of the rooms. Ernesto, the property manager, helped us arrange for masseuses to come to the house and give massages on the top veranda of the house which was a wonderful experience. We also arranged for cooks to come to the house and prepare a meal one night, which we really enjoyed. The house is walking distance to everything, with a steep path cutting a direct route into town and to the beach. We didn't rent a golf cart and we were fine without one, however, those with mobility issues may have a hard time getting down the path due to the steep incline. Overall a great experience! We rented casa Paloma in Sayulita for an anniversary celebration with our adult children and 4 grandchildren (8,5,3 and 1). The house is absolutely perfect. Everyone had their own space, yet the common areas were large enough to accommodate our whole group. The staff took wonderful care of us. Ernesto arranged a cook for several meals. The town of sayulita is absolutely charming...big enough to be of interest for the week, yet small enough to be intimate. The house could not be in a more perfect location. We took the walking path to the bottom and then just one block to beach or town. This house would be perfect for almost any group, families with kids (some caution around decks) couples. Absolutely no car necessary with this house. We will never stay anywhere else in Sayulita! For my 40th birthday, myself and a group of 14 adults and children stayed at Casa Paloma and Villa Colina at Dreamer Circle in Sayulita for 9 days. We rented the golf cart and had Dora, the housekeeper and beautiful chef, prepared many delicious meals for us. It was very hot so having the A/C to sleep at night in all the bedrooms was essential for us - we live in Northern California and aren't use to the heat. The views, the design of the homes, the tile, art, linens, everything is done with great skill and consideration. Dennis greeted us when we arrived and all week, our property manager, Ernesto, was available night and day to help with anything. He arranged massages, meals, transportation and even helped us when a major storm took the electricity out for a few hours. It was a special, peaceful trip to Sayulita and I am so very grateful to have found these homes. Our family and friends just returned from two weeks spent at Casa Sonadora in Sayulita. The location is perfection-super close to all the action in Sayulita, yet quiet and very private. We were traveling with small children, who spent hours in the pool. Between the large bedrooms, and the various outdoor spaces, there is plenty of room for alone time as needed. The kitchen had everything we needed. Being there in July and August, the weather was hot, and with the exception of some summer storms which took out the power throughout Sayulita a couple of times during our stay, the air conditioning worked great. Eric is very responsive to any questions or concerns one might have, and Carmina helps keep the house tidy. I think our group has been spoiled by this house, as I can't imagine staying anywhere else! 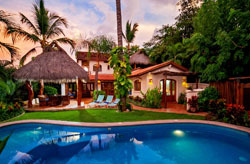 We choose Villa Colina in Sayulita for our family vacation. We were 5 adults and 4 children, age 4 to 14. We all enjoyed the stay at Villa Colina tremendously. It was everything I had hoped for. The house was spacious and the three bedroom suites were on different levels, so all the adults had some privacy. My grandchildren loved the pool and became fond of the house cat. I was impressed by the art around the house and the views from the different levels of the house. The location was excellent. It was very close to downtown and the beach. The manager, Ernesto, arranged our transportation from and to the airport, which was a great help. The drivers even stopped at a supermarket so that we could get groceries. 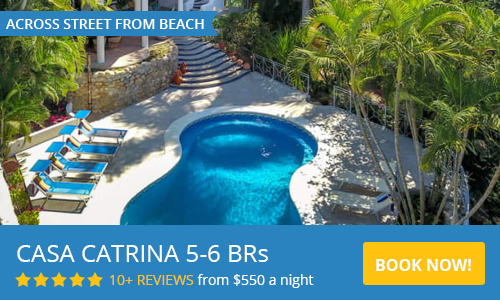 I highly recommend this property as a place to experience a great family vacation in Sayulita. Couldn't dream up a better Sayulita experience. Everything about our stay at Casa Paloma in Sayulita was incredible. From the start, excellent lines of communication were established and the whole booking process was exceptional. Our group was picked up through the transportation service provided, and a spacious air conditioned van brought us to the beautiful residence that is Casa Paloma. The pictures do not do this property justice, it is the best place to stay in Sayulita for many, many reasons. I would highly recommend this property to anybody and will definitely be staying here again. While staying at Casa Paloma you can expect impeccable service, breathtaking views and an environment that promotes a communal feel while having the space for privacy if you want it. It is tastefully decorated with love and thought put into every detail - it is the perfect getaway. Thank you so much to all the staff who made this special occasion even better. 6 to 16+ bedrooms in this lovely estate of four homes. The rates listed are for all four homes so they are considerably lower if fewer than all four properties are booked. You can see the individual rates by looking at Casa Paloma, Casa Sonadora, Villa Colina, and Casa Carino separately on this website. The Holiday season refers to President's week, Easter, and Thanksgiving. For Christmas and New Year's weeks, please contact us for current rates. My wife, Joan, and I, Dennis, live most of the time in an area frequently referred to as the northern tip of the wine country in California, just above Napa Valley. I recently sold my Internet Marketing Company and my wife is starting to wind down her successful art business. We are semi-retired now, but I still manage to keep busy with all my real estate projects, investments and family. We travel quite a bit together and with our two married daughters and their husbands and their growing families. One of our daughters is a successful Interior Architect in Los Angles who is married to an entrepreneur who is the majority owner and CEO of a major software company. The other daughter is an occupational therapist, whose husband is a Director of Photography. We are an active group. We all love to ski, hike, scuba dive, surf, bike, boat, ride motorcycles, and hang out together in beautiful environments. We are recent grandparents with both daughters and are thoroughly enjoying this delightful new addition to our lives.